When people talk about fish there are few species which excite them more than sharks. The idea of keeping sharks in the home aquarium is startling to many, yet there are several species which are actually well suited to this kind of habitat. Active, intelligent and charismatic fish, they can make fascinating pets. One thing you probably already know about sharks is that they're big - some grow to over fifty feet long! Obviously, for the aquarium, we'll only be considering the smaller species, but even the very smallest ones are at least a foot and a half long at adult size. For this reason you'll need a spacious aquarium. Sharks also need plenty of room because they move about a lot. They don't need a lot of ornaments or plants to keep them happy, but will do best if provided with a few hiding places. Bottom-dwelling sharks often do a lot of digging, so make sure your aquarium doesn't contain any rocks or ornaments which might be overturned and fall on your sharks, causing injury. Because sharks are especially sensitive to electromagnetism you should avoid metal of any sort in their environment. Contrary to popular opinion, it is possible to keep sharks in community tanks, but you should be careful about the fish you choose as their companions. Smaller fish may well be eaten, and fish with a tendency to nip may seriously injure the sharks because they lack the protection of scales. As a rule, snappers, groupers and goatfishes make good shark companions. 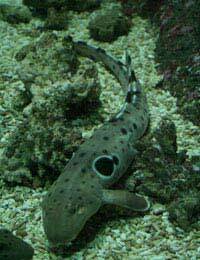 Coral Catshark -One of the smaller species available, this shark is happiest in a reef environment. Brown Banded Bamboo Shark - A bottom-dweller but still quite active, this has an attractive stripy pattern when young which fades to brown as it ages. It is comparatively hardy and adaptable. Epaulette Shark - Another bottom-dweller with an attractive spotted pattern and dramatic eye spots, this is a very tactile shark. Although sharks tend to prefer live food, they will happily eat most meaty foods, and the key to keeping them healthy is to provide plenty of variety. Seafood such as clams, mussels, shrimp, squid and scallops is ideal, as are smaller fish. Sharks will often go off their food if stressed, so you may find it difficult to get them to eat immediately after moving them into your aquarium. If this happens, be patient and give them a few days to adjust. You may achieve better results by feeding them at night, just after lights-out. As your sharks grow bigger, feeding times can be cut down to just two or three occasions a week. This will help to slow growth and keep them happier in your aquarium; it will also reduce pollution from their waste products. They need very clean water in order to thrive, so you'll need a good filtration system and you'll need to make frequent water changes. They usually prefer aquariums with sandy bases which they can dig in and comfortably rest on. Sharks are sensitive to some fish medicines and should ideally be placed in quarantine if you have to treat your main aquarium. In particular, they should never be exposed to malachite green. Although they are difficult to keep and unsuitable for beginner aquarists, looking after sharks properly can provide a very satisfying experience. Unlike many species of fish, they take a highly active interest in their environment, including what's going on outside the tank, and they often enjoy physical contact with humans - don't be nervous if they rub up against your hands when you're cleaning the tank. They are sensitive and delicate and need a lot of attention, but they'll give you plenty of pleasure in return.